During the 1860s, London was physically transformed: gigantic new sewers were built, underground railways constructed, new streets and overground railways levelled slums, and the river Thames was embanked. What all of this new construction did was to confuse existing notions of vertical space in the city, that is, between the underground and the overground. 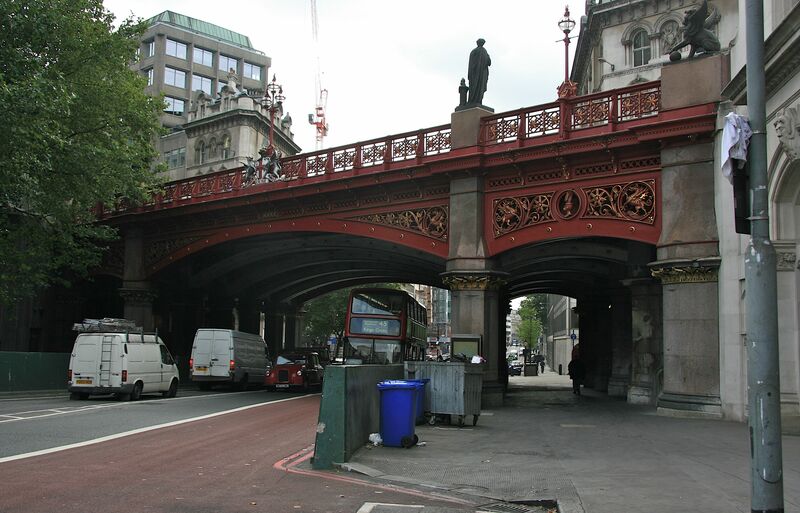 Nowhere is this more evident than in the Holborn viaduct, built from 1866 to 1869 at the boundary of the City of Westminster and the City of London. Before it was built, traffic going to and from the City of London had to negotiate the steep-sided Holborn Hill, a road that descended into the Fleet valley before climbing Ludgate Hill on the other side. The Holborn viaduct filled in this space, completely levelling the hill and transforming the environment. All that is visible today is the bridge across Farrington Street, beneath which the old River Fleet is enclosed in a sewer. Lavishly decorated with ornamental cast iron, featuring the emblem of the City – the winged dragon killed by St George – the bridge is only one part of a vast network of vaults that honeycomb the spaces either side of it. Within these spaces run gas, electricity, water and sewage pipes and, when built in the 1860s, was the first attempt in Britain to unify urban infrastructure in a single space. 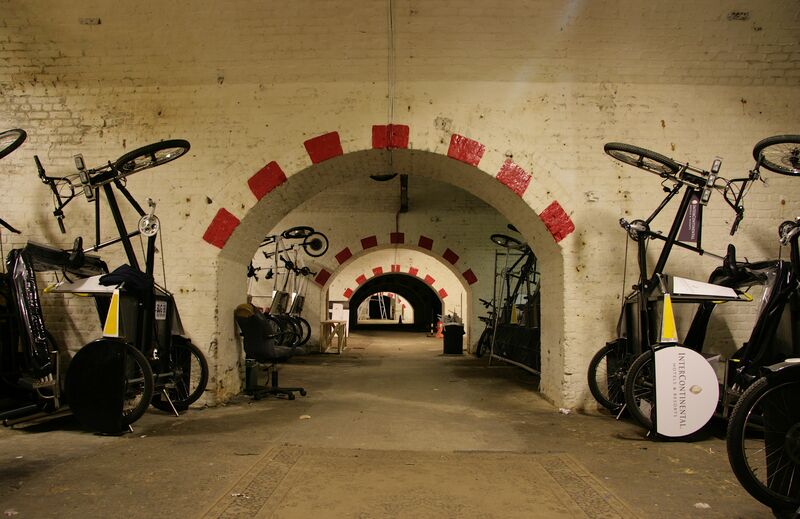 The vaults are now used for a variety of purposes: as a cavernous wine cellar for Oddbins; as a store for a bicycle hire company; and as a novel space for wining and dining. 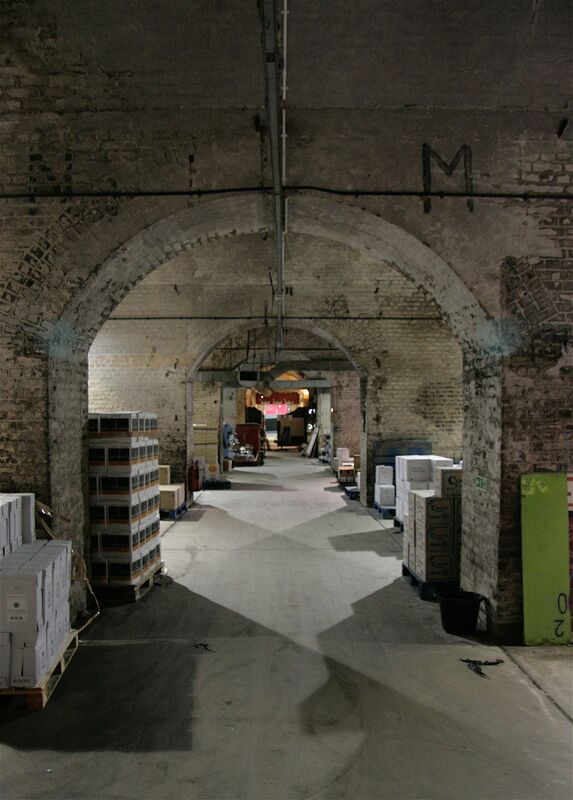 Everything about these spaces suggest that they are underground – the musty smell, the dark brick arches, and absence of natural light; yet, you enter them on street-level. 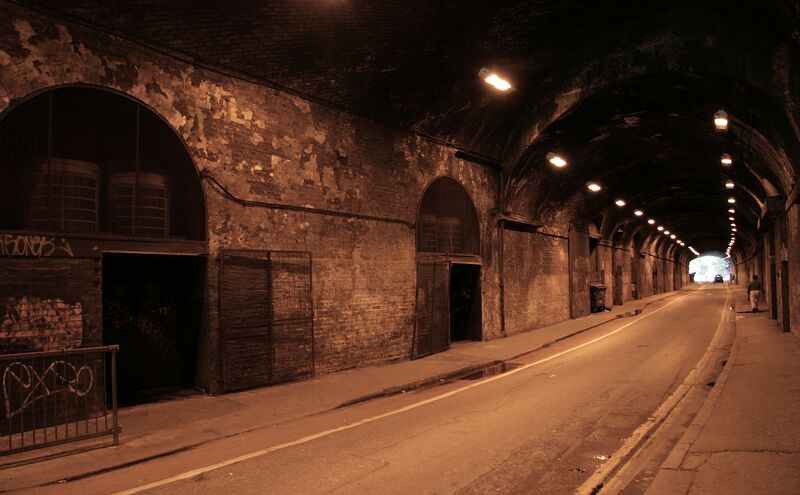 This mixing up of underground and overground space is characteristic of Victorian London, particularly in its vast stretches of railway viaducts, which created a multitude of brick arches over the city. At London Bridge station, these arches converge to form a 1/2 mile-wide viaduct that towers over the surrounding streets, and into which burrow several roadways. 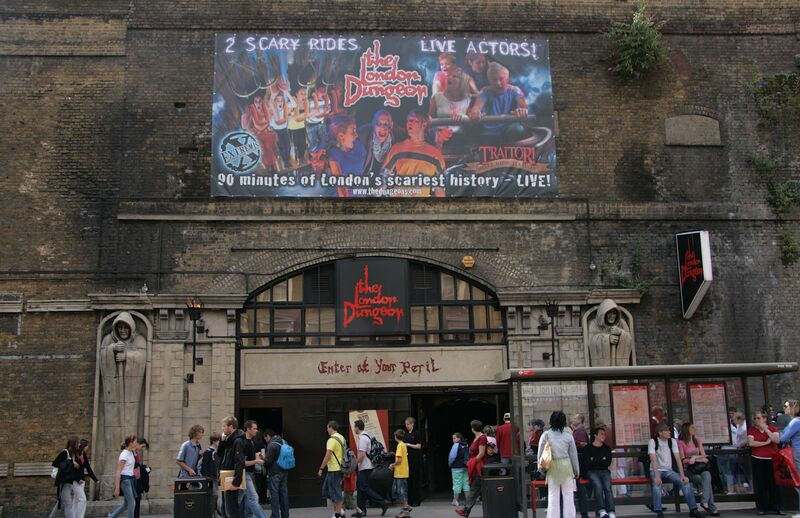 As a testament to the enduring appeal of the Victorian underground, part of the space inside the London Bridge viaduct has been converted into three of London’s most popular tourist attractions: the London Dungeon, the London Bridge Experience and the London Tombs. Drawing on the more sensational aspects of London’s underground history – ghosts, murderers, death and torture – these themed attractions reintroduce the ancient underground into a real Victorian space created for entirely practical purposes. Such a contradiction serves to highlight both the very real differences between the imaginative associations of underground spaces and their intended function, and also the fact that both are inevitably bound up together. While the London Dungeon conjures up its fabricated histories of the city’s underworld in its safe and convenient pseudo-subterranean setting, London still has its real underground spaces and communities that continue to haunt the city. If visitors to the London Dungeon want an authentic subterranean experience, they might be better advised to find a homeless person sheltering in one of London’s subways and give them the extortionate entrance fee. A feature I liked was the tiling and decoration in the stairs down to Farringdon Street. The stairs were much wider and with more vertical space than I anticipated too. Had a look at it midweek in September and hardly anyone about. Fascinating. However, the mythical emblem of the City of London is not a dragon but a griffin – also features as an emblem of London Transport, and statues of griffins are placed at the sites of the old gates of the City (Ludgate etc) to guard the City and its inhabitants. I sometimes ponder the griffin and why it is such a popular symbol. Significant in my neck of the woods, Brentford, where we have Griffin Park, home of the eponymous footie team, the Griffin pub and down the road there is Fullers’ Griffin brewery. I keep meaning to join the dots, so to speak, will get around to it, I’m sure. We have our local history soc meeting this evening, I’ll ask. The City emblem is in fact a dragon and not a griffin – a popular misconception. As a City of London guide I’m often asked about it. Enjoying these pages . . . Thanks John. I’ve been thinking a lot recently about the difference between a dragon & griffin as I’ve come across similar motifs in Leeds and Halifax. I realise now that although the City of London emblem is called a griffin, it is in fact a dragon (as in the coat of arms). Do you know why it acquired the griffin name as these beasts are quite different from dragons? Where is that space with the bicycles? Hi Alec. It’s underneath the Holborn Viaduct – not Farringdon Road (the main section) but Shoe Lane further up towards Chancery Lane.